2. Navigate to the Offline Order File which you can locate on the My Account dashboard and the Basket page. 3. Click the "Select File" button in the My Account section or the "Upload File" in the shopping basket. You will be able to upload a file from your hard drive. 4. Once you have uploaded the file you will need to select 'Add to basket' to add it to your order. You may add Items to you shopping basket at any time using the "Quick Order" feature. You will find this in the top navigation next to the basket icon. 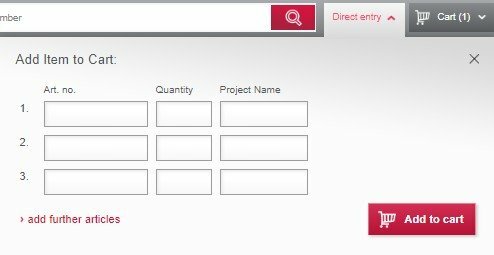 Simply select this feature and you will be able to enter the Item Number, Quantity and the Job Reference (this field is optional). After you enter the item number and quantity - the system will verify the item number. If not correct you will receive a message asking you to check the item number you entered. You may enter as many items as you wish by selecting "> add further items" at the bottom left of the window. Press the "Add to Basket" button to add these Items to your basket. After selecting checkout from the shopping basket page, you will start the ordering process by selecting a delivery address. You will be shown a list of all the delivery addresses available for your account. If you want to add a new address you can do so by scrolling the bottom of the page and clicking 'New delivery address'. If you want to view all delivery addresses you will need to go to the page called 'Addresses' located within the 'My Account' menu. If your invoice address is incorrect please contact our customer service team.